Yup, today I officially resigned my ownership of the Notes from Rational Support blog, and all other associated social accounts. I had actually transferred duties to a new team of colleagues over the past month, in part to help cover for me while I vacationed last week, but in a larger part to take the space and bring it to even higher levels of value. But today it all comes to a pivotal point where I’m letting go of my ownership access to the blog as part of my continued transition in to the IBM Internet of Things support organization where I am working on social business strategy and logistics like I did for Rational Support since 2008. As you may have already noted from prior posts on that blog, I am leaving it in the very capable hands of Denise McKinnon and Naomi Guerrero. I couldn’t be more pleased to leave this institution in their hands, much like Kelly Smith did for me a few years back. Kelly started the blog in 2009, and drove it to great heights in the beginning, so much so that when I took the lead in 2012 (and then the reins when she transferred to newer opportunities in 2013) I was quite daunted and unsure if I could keep the blog as valuable and relevant as Kelly had. Thankfully, I saw the value climb as I pulled in other authors to aid in content creation and to provide deeper technical topics for our clients. 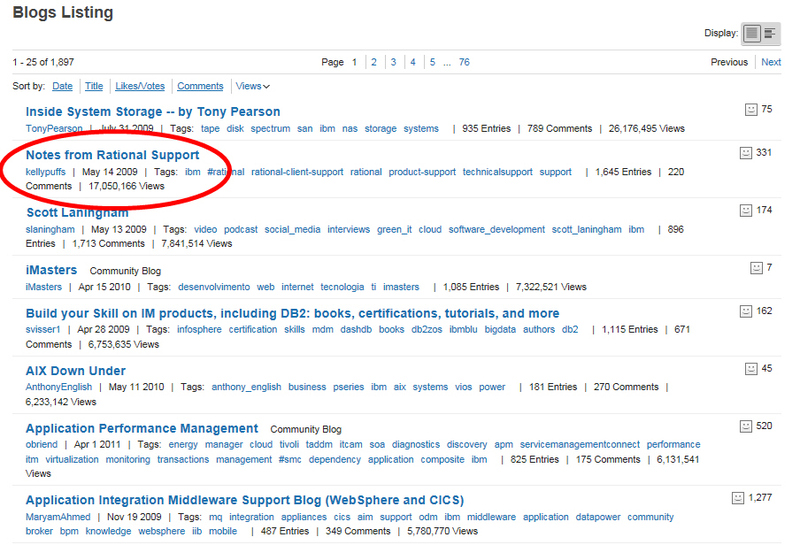 This helped us continue the climb in value and finally saw the blog hit and maintain the #2 most viewed blog on developerWorks for the past two years running with over 17 million views to date! My pride in what we’ve achieved with that particular blog space is hard to miss, and of course makes it even harder to step away. Even harder still is the fact that it has been part of my daily life since I began helping Kelly in 2010. But, as I noted in my farewell post on Notes from Rational Support and in the title here, change really IS the only constant, and with that I have to acknowledge my time to move on…. Thankfully, I’m not moving far! While I no longer run the IBM Rational Support social accounts, I AM still involved in social at IBM. More specifically with the IBM Internet of Things support teams. Now I hear you asking… What IS IBM IoT Support? And THAT, my friends, is a great question! IBM IoT Support is a team of IBMers who are now part of the new IBM Internet of Things organization supporting the tools makers like our clients need to build components and connected devices. IBM IoT Support is focused on helping our audience, the makers, with their product questions by providing content relating to the various products covered by our new division. Through our focused support of asset management and continuous engineering tools, we are here to provide our clients with the best support in the industry; to help them be successful with the applications and components to ensure your work on the connected devices in the Internet of Things brings you the right value. To that end I’ve been working the past few months to create a few new social channels like our Notes from IoT Support blog, our new Twitter account, and our new Youtube channel. So you can see, I’m still doing the same job just in a different division of IBM. Of course I still have my hands deep into social support strategy as well as the day-to-day administration and content curation of our social channels and often act as a consultant helping colleagues in similar spaces navigate some of the speed bumps we all encounter in social business. Turns out, that is one of my favourite parts of this job: helping others be successful in their own areas of focus, which I guess is a trait that helps me be successful in my own areas as well.